A special gift out of Italian marble! 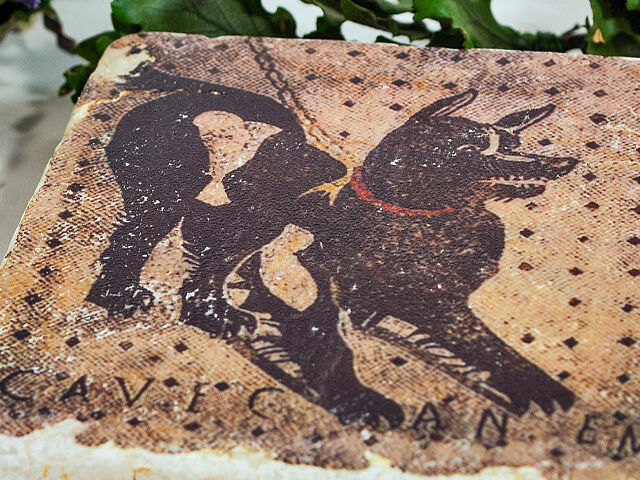 The coaster with the inscription 'Cave Canem' - 'Beware the dog' out of Italian and real marble is a very special gift! Give it with g good drop of wine and make someone especially happy. 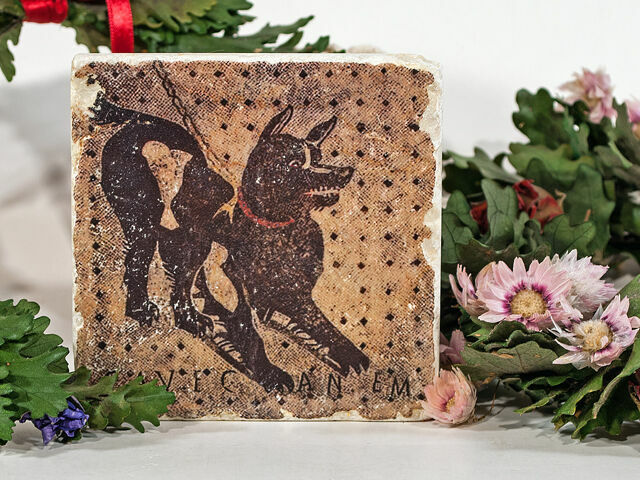 For dog owners it should be said, that the coaster as well can decorate as a picture on a wall! 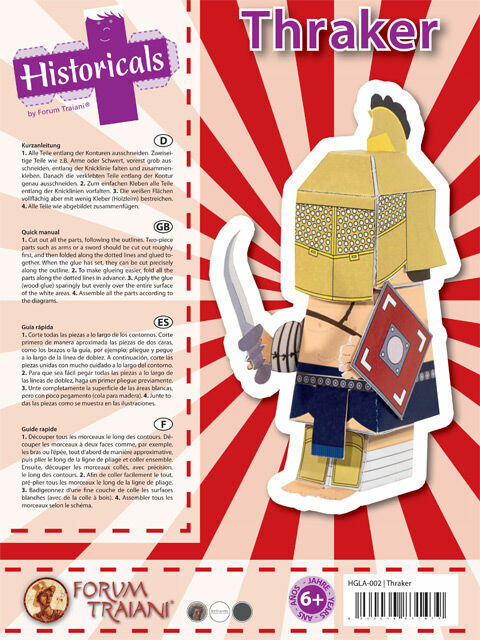 Roman history as you coaster or picture on the wall! Straight from Italy comes the coaster for glasses out of real marble. 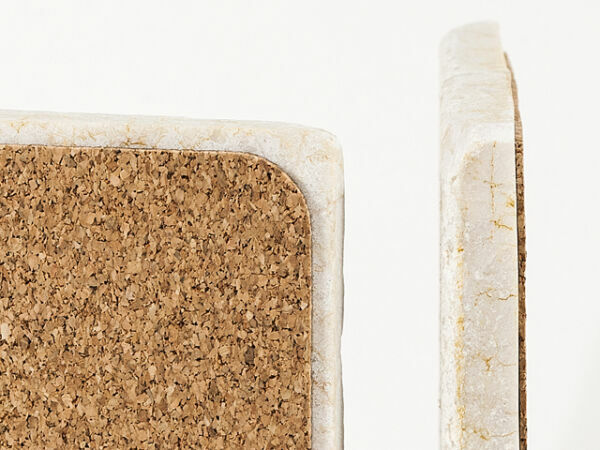 On the back it has a thin cork protection for not scratching the table's surface. 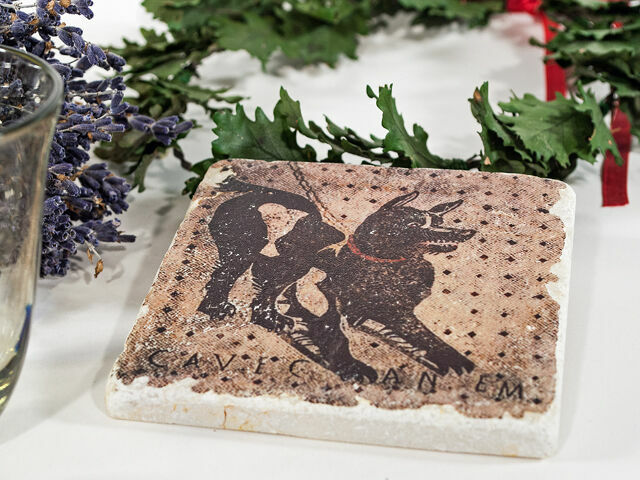 In a lavish process of thermo printing the colourful depictions are printed, which a especially picked by the Forum Traiani for you with ancient motives. Cave canem is a Latin warning (consisting out of cavere 'shrink', beware and canis 'dog' and means 'beware the dog'. 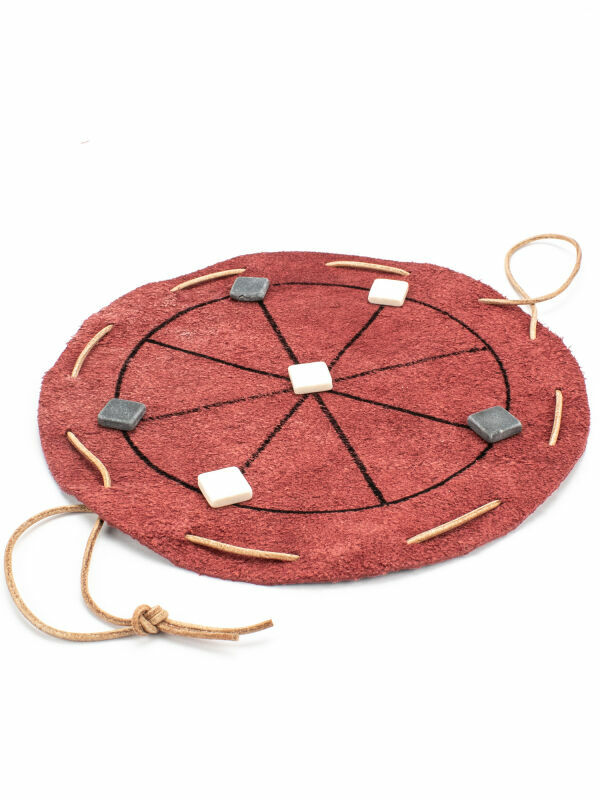 Known became the sentence because of the discovery of a very well preserved floor's mosaic in the ruins of Pompeii. The saying became that famous, that as well in the English language it was used instead of the inscription 'Caution, vicious dog!' to put it up on fences and doors. The mosaic by the way is found at the entrance of a long entrance hall in the so called 'house of the tragic poet'. 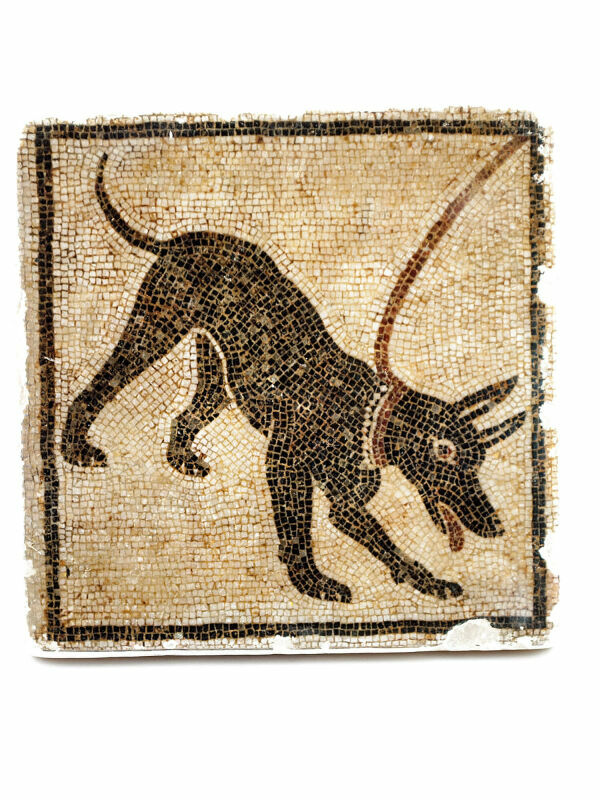 Directly behind the door a black and white floor mosaic shows a great chained dog with the saying: 'Cave canem'. 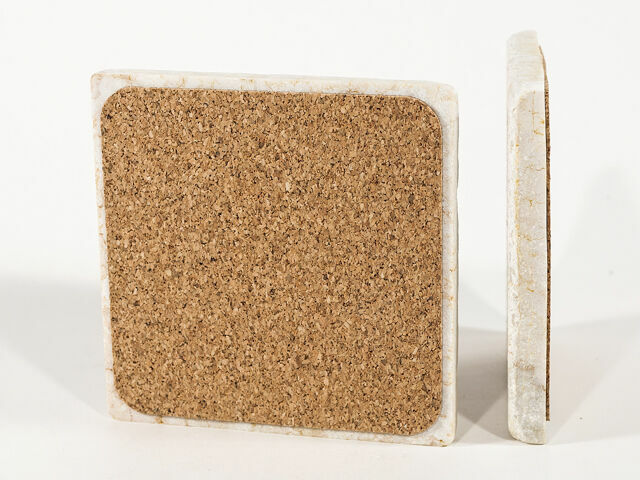 You can use the coaster for glasses and as well as a small picture on the wall or to put other objects on top of the ancient surface. For sure every piece is a special gist with the fitting packaging, that is contained in the scope of supply.